Yesterday I stuck myself with a dirty needle at work. I was doing an I&D of an abscess that I know was full of MRSA (ie bad bacteria). I had injected the area with Lidocaine, cut into it, and was expressing a lot of pus. (for non-medical people, basically I was cutting open a pus pocket to drain the infection, I do this a lot in the ER and enjoy it probably more that I should) I went back to grab the needle to flush the area and numb it some more, and that's when I stuck myself. And it wasn't just a little poke in the glove, I stuck it bad enough that I pulled my hand back in pain and it instantly started bleeding. There was also a clear puncture hole in the glove. I probable shouldn't have, but I finished the procedure before I did anything about it. Needle sticks are pretty much going to happen to you at some point when you work in healthcare. It actually wasn't the first time I've stuck myself. It happens sometimes when I'm suturing kids up and they thrash about, but I never really worry about catching anything. Even with this stick, I wasn't worried about HIV or Hepatitis or anything like that. I'm concerned about catching MRSA from the stick. Since this all happened at work, I had to go through the whole process of signing in as a patient and doing the worker's comp thing. Then I had to have blood drawn. 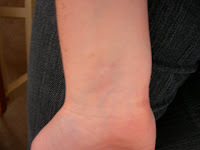 It was freezing cold in the ER and I'm a hard stick anyway, whic meant my veins were pretty much nonexistant. So in order to get blood, I got stuck an additional 3 times. 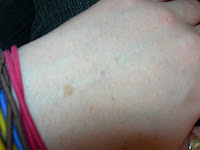 The 3rd time being in my wrist, which is really painful, but it was the only visible vein and they needed blood. 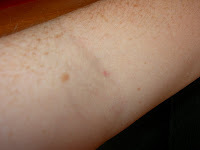 When they finally did get a vein, it took like 5 minutes to fill the 3 tubes because the vein was so small and I was bleeding so slowly. On top of all of that, I had to get a tetanus shot since I haven't had one in 10 years. That means that my arm is horribly sore today and I can barely move it. So, yeah it was an "exciting" day at work. At least now if I catch "the funk" (as a patient of mine called it yesterday), I have an offical record of it and my employer will be responsible for paying for any complications. Hopefully it will be okay. I pretty much know it will be and that the chances of catching anything are very low, but still MRSA is the one thing I worry about catching at work. I don't worry about getting all the other diseases that we see, but I do worry that I will pick this up. We see some really bad infections of the stuff and once people get it, sometimes they have a hard time getting rid of it. It affects people from all walks of life too. One of our nurses even got it and had to be hospitalized for it. So keep your fingers crossed that I don't get the funk! So I've been 25 for almost 2 weeks now, and I've decided that it's not too bad. In fact, it even has a few perks. My car insurance went down $33, which is fantastic! It's crazy that with the passing of one day, the insurance company suddenly decides that I have become a more competent driver. I'm not complaining about it, I just think it's interesting. It seems that to a lot of people 25 sounds much older than 24, because now when patients at work ask how old I am and I say 25, that for some reason sits better with them. Another thing that came with turning 25 was having to renew my driver's license, which I almost forgot to do. I realized it several weeks before my birthday and had planned to go to the office the week prior to my b-day, because I wanted to take a new picture. However, I kind of forgot about it and realized on Friday at 7pm, that I never made it to the DMV and it expired the next day! So, instead of panicing, I simple logged on to tn.gov and renewed it online. It's a bit crazy that you can do that over the internet, but I was very glad that I could. I am stuck with the same picture for the next 5 years though, unless I want to pay for another one. My tattoo is healing nicely, and I like it alot. Which is a good thing, seeing as how it's there for life! I decided turning 25 was a good occasion to get another tattoo. Since I got the first one in Paris with my college roomie, I couldn't just pick a random day to get the next one. I've wanted a second one for a while (it's true what they say, they are addicting), but was waiting for the perfect time to get it. In case anyone was wondering, it hurt a lot! 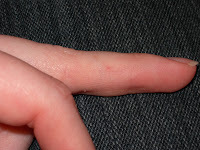 Actually it wasn't so much pain, as it was a very intense stinging. Fortunately, it didn't last too long, and there were frequent pauses. Turning 25 also got me thinking about some of my past birthdays. I must say I remember some really random things. Like I remember my 4th birthday party very well. It was a Rainbow Bright Party that I had with my friend Erika, who has the exact same birthday as I do and lived down the street from me growing up. She blew out the candles before her mom counted to 3, so her mom relit them and I got to blow them out all by myself. I know, very random, but also very vivid for some reason. Turning 10 stands out too, maybe because I finally hit "double digits" and as a kid that's a big deal. I had a "carnival" themed party with 3 of my friends. I don't remember a lot of what we did, but it ranks up there on the birthday list for some reason. Maybe because we didn't have parties every year, so when we did, it seemed really special. There are also a couple of birthdays that I remember, and wish I didn't. My 22nd is one of those. I didn't celebrate my 21st in the "traditional" way because I had just started PA school in Nashville and didn't really know anyone well enough to celebrate it with. So instead, I celebrated my 22nd birthday with the help of a couple of my PA friends. I had a little too much fun, and I hope to never feel like that again. Puking in the parking garage was definitely the low point of the evening. The next day wasn't too much fun either! Unfortunately, my 25th birthday makes the list of ones I'd rather forget as well. My whole birthday experience ended up being good, but the actual day of wasn't too great. (check out my facebook note for more on that) Fortunately I have wonderful friends and family who helped me get through it and tried to make my birthday experience a positive one.